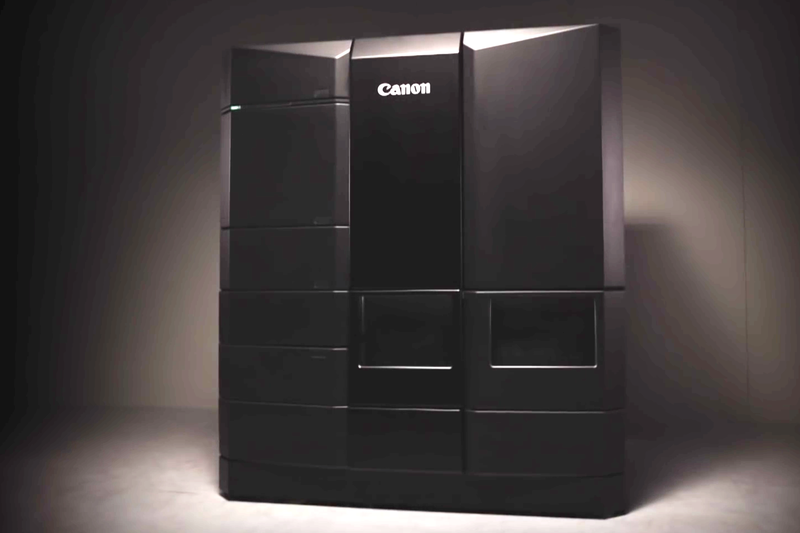 If Canon were to use its prototype 3D printer to print components for production models, Rep-Rap style, customers might see it a little faster. Canon claims, after all, that its new 3D printing technology will be good enough for rapid manufacturing, in addition to the rapid prototyping for which many businesses already use 3D printing. However, while the company showed off samples printed with the prototype at Canon Expo, an event for its customers in Paris this week, the machine itself was a no-show. It's still somewhere in Japan, staff said, and is probably at least two years from commercialization. Although it doesn't yet make its own 3D printers, Canon already sells them: Two years ago it began reselling models from 3D Systems in Japan, entering the European market in February this year. 3D Systems holds key patents on a number of printing technologies. The most familiar of those technologies, and the one most commonly used in hobbyist printers, is fused deposition printing, in which a thermoplastic material is heated until it melts and then piped like cake icing, layer on top of layer, until the model is complete. Some of the 3D Systems printers Canon sells for rapid prototyping work in this way. Canon drew a large crowd at its event with demonstrations of two of the 3D Systems printers it resells that use other printing technologies. One involves sprinkling powdered material onto a platform, layer by layer, melting parts of it with a laser so they solidify and attach themselves to the previous layer as they cool, the other builds the model in an ever-deepening bath of molten polymer, curing the layer on the surface with an ultraviolet light in order to solidify it. The finished models are easily removed from the powder or liquid for cleaning. Reselling another company's printers is not enough though, according to Canon Europe's 3D printer marketing manager, Ryan Milne. "Customers want to see we are bringing our own technology to market," he said. That's where Canon's prototype comes in, although it could be two years or more before it goes on sale. "When it comes to market, we want it to make an impact," Milne said. Don't expect to see it in your local hobby store, though: It will definitely be aimed at professionals and industrial users, he said. The printer Canon is developing uses a new printing method involving lamination, employees at the expo said, without providing further details. An animation in a Canon promotional video appears to show it printing the layers of an object separately, then joining them together -- unlike existing fused deposition devices, which print new layers directly on top of existing ones. Milne wouldn't comment on the lamination. The printer will be about as tall as him, around 1.8 meters, he said, and will print in resin, with water-soluble supports. It's hard to gauge from those clues what the device's print volume could be: the largest output sample presented, consisting of two toothed wheels, was 50 millimeters in diameter and 12 mm high. The pieces looked almost as though they had been injection molded. They weren't as glossy and slick as, say, an Apple iPhone accessory, but you could easily imagine them turning smoothly inside a machine requiring some precision, such as an inkjet printer. Precision and surface finish are two features Canon says the printer will improve on, reducing the need for secondary processing of printed objects. Canon also claims it will be able to print a wide variety of materials, including polypropylene (PP), polyethylene (PE), polyoxymethylene (POM) or acetal, polyamide (Nylon), and polymethylmethacrylate (PMMA), the polymer used to make Plexiglas or Lucite. Its printed samples included materials colored black, white, red and blue, and materials it said have high stiffness, transparency, elasticity, flexibility or impact resistance. If it's able to print a single object composed of several of those, then short-run or custom manufacturing could indeed be in for a shake-up. Researchers at MIT have already created a one-off 3D printer that can build with ten different materials at once. By the time Canon's printer is ready for market, though, it's likely that 3D Systems and others will have come up with new ways to print too.